I'll have you know... I've done absolutely NOTHING today except work for my little project. Really, creating the project was pretty quick. I started last night and probably finished about midday but the rest of the day was spent sorting by color. :( I really should have been working on DT projects but well... let's hope I can get those done tomorrow! Yikes! Yesterday, I was commenting on entries to my little challenge blog, Inspiration Destination. There was an entry using a new release from Alicia Bel. This crafter actually used one of the stamps I'm not showing you today but she made a light bulb go off in my head for sure! lol So I went and purchased the entire new release. Ha! I also meant to flip some of the images so all the gals wouldn't be facing in the same direction; however, I forgot. But the other digi stamp that I plan to use with coordinating colors faces in the opposite direction so I'll be able to put them side by side and it won't look so symmetrical... to a point. So let me show you what I started... and probably won't finish for several weeks. Here's a close up of one so you can get a better idea of what it looks like. 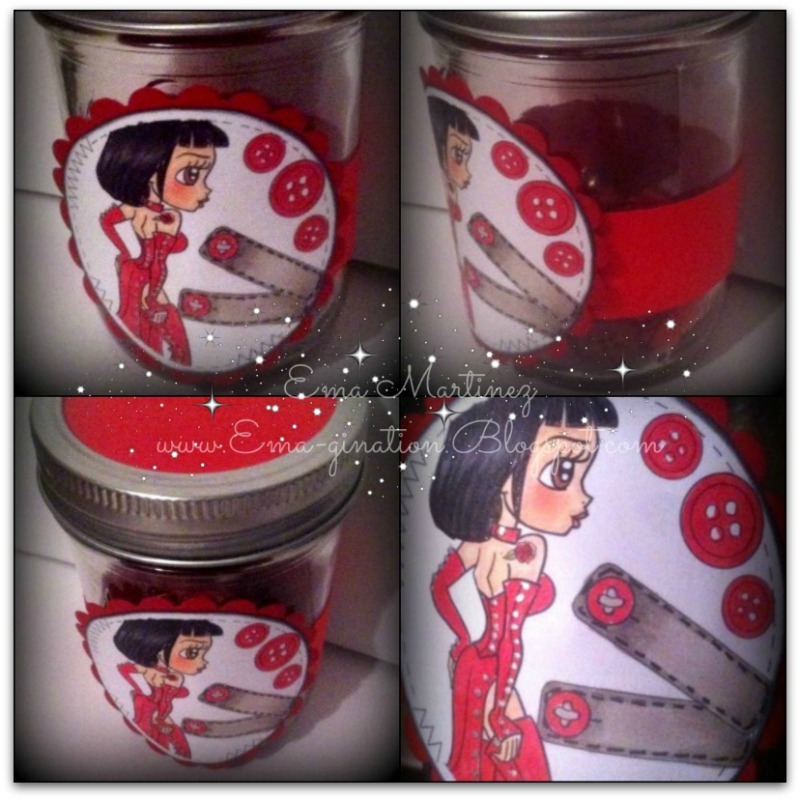 As you can see from the labels in front of the jars, there is also a label for ribbons, scissors and flowers. I've started coloring the ribbon labels and scissors but I need a break! lol I'm starving! I'm still contemplating adding words to the labels. I'm not sure how to write it in. So I'm thinking on that. I used nothing but scraps for this project! Woohoo! lol Well, except to print out the images but the scalloped circle dies are from scraps and the bands wrapped around the jars are from scraps as well. Like I wrote earlier, this project took almost my entire Saturday but that's cause I had to sort my embellishments by color again. After I'd sorted all my embellishments in jars as I wrote earlier, I met someone online from here! We met and she went on and on about how we were gonna craft together and go on retreats. She took me to some crops and so I had taken everything out of the jars and put them into baggies by season only. Because... she said we were gonna have to be mobile. I believed her. Imagine my surprise when we were in a FB group and she made a comment about the HUGE age difference. :\ I forget now but I'm probably about 15 years her senior. She said that although I was ssooo much older, I was still fun and she imagined we'd be friends for life. Well... apparently... she was one of those people who meant... until someone better suited came along. Her husband graduated from college and started working. One of his new coworkers crafts and is the same age as my 'friend' and so I was dumped for a younger woman! Months went by without a word from her. When she finally did make contact, she'd always cancel. Oh wow! I see you have been very busy. I wish I could be as organised. I also wish I had the space to put all my nicely organised stash :p.
Anyway, I am very happy you liked our new images and thank you for playing at Aliciabel Challenge Blogs. Oh this is soo awesome, I love your project, Ema.